Well, I am back from a long weekend in the Chicago area. Ever heard of Chesterton, Indiana? Neither had I, till my friends moved there. Paul and Tomania Kelly generously hosted me in their fantastic new home for four days. It was great to catch up with Tomania, especially (since she really is the reason I went; sorry Paul). She is one of those friends with whom one can always pick up with where one left off. She pops up in a post every once in a while, so you might recognize the name; and, if you do happen to know a Tomania, chances are it is this one (Tomanias don’t grow on trees, at least not in this country). While checking out Tomania’s computer files this weekend, I was able to snag this pic from our reunion in Maine last summer. Paul is the tall guy in red, and Tomania is quite obviously the only female in the pic. 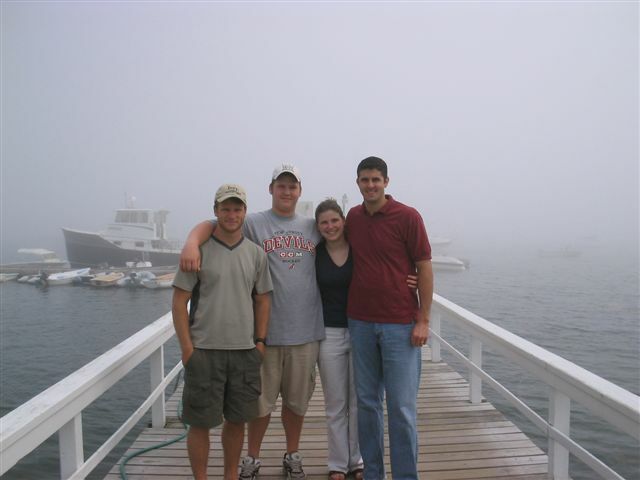 She’s standing next to her big little brother, Ben; Steven Banks, Paul’s good friend, is there on the end. I avoided being caught on film by insisting on taking the picture ;o) I could write more, but I’ve got laundry and all kinds of office work to straighten out before I head off to my first Red Sox game of the season this evening. Suffice it to say, Tomania is a blessing. So are really cheap airline tickets, or else I’d never see her! Thanks for the awesome weekend, Tomania! Well, I just took a lunch break at the Border’s bookstore cafe. Got my little sandwich, chips, coffee, and a handful of Lindt truffles and sat down with a pile of books in a nearly empty cafe, ready to enjoy an hour away from the phone, the computer, and anything resembling a television set. But peace and quiet evaded me, as they usually do when I try to eat out alone. No dice. There were three old (and I do mean old) ladies sitting in the cafe area, and talking–loudly. Very loudly. I’m not sure they realized how loudly. Like I said, they were old. I don’t mean to be disresepctful at all. Just stating the facts.